The high school residential program provides an opportunity for students to grow socially and spiritually in a community where they care for themselves and each other. In addition to benefiting students who participate in the residence program, the program enriches the entire school with an international perspective. The residential program is an important part of Lancaster Mennonite School’s Lancaster Campus, providing a “home away from home” for many students who otherwise would not have been able to attend. Many students comment that the residence program was among the most significant parts of their education. The five-day program allows students to go home on weekends whereas the seven-day program is for those from more distant locations. International students who want to attend the Hershey Campus can stay in private homes with host families. 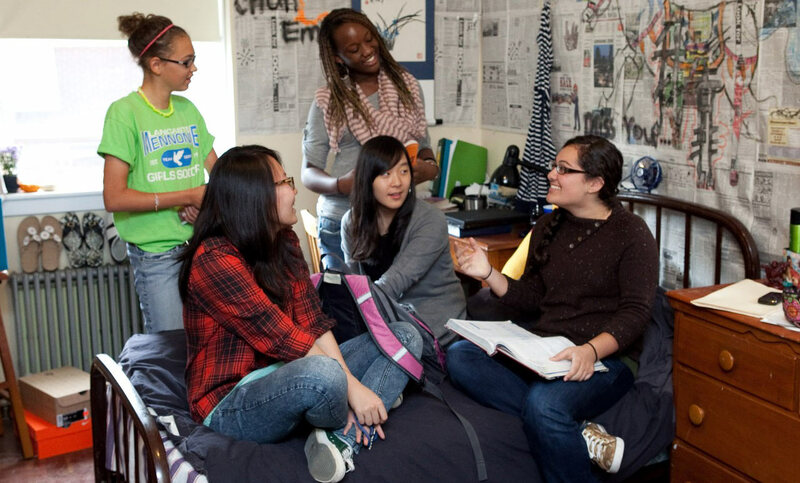 Equipped with two on-campus dormitories, Graybill Hall and the new Millstream Hall (opened in February 2015), the boarding program offers a great opportunity for students to prepare for the increased independence and responsibility of college life, and to share their own unique background and experiences. Approximately 60 students currently live in the residence halls on the Lancaster Campus. They are a diverse group of students from other parts of Pennsylvania and from other countries such as China, Ethiopia, Korea, Spain and Cameroon. Each of the halls has adults serving as resident advisors. A “dorm council” allows residential students to be part of creating a community that transforms lives. The five-day residence hall program is for those who can spend weekends off-campus with their family or a host family. The seven-day residence program includes room and board for weekends. Breakfast and dinner are included; lunch is purchased separately.